I found this on Big Dope's computer and couldn't resist sharing. There was news this week about a school in Utah where the officials took an unusual step in dealing with school lunch payments in arrears. 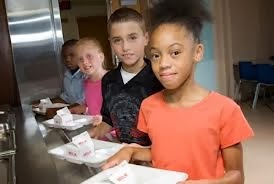 After dispensing meals one noontime, officials went around and seized the trays of the kids whose lunches hadn’t been paid for and threw them in the trash. Problem solved. Now these were not kids on the “Free Lunch Program” but simply were those whose parents had not paid for the lunches in a timely fashion. Still, it made me think of the Free Lunch Program, a friend I had while serving in the United States Navy, and a former professional football player. Let’s see if I can connect the dots. I teach a course at a local university. The course is “Intro to Public Administration” and the class members are juniors and seniors taking it as an elective. So, it is not “their first rodeo” and we have some wonderful and spirited discussions. Each time I teach it, the subject of the free lunch program seems to arise. It is simply heartbreaking to hear a young woman talk of the shame associated with being identified, before her classmates, as one on the Free Lunch Program. It is evidently a mark of shame she will carry with her for the rest of her life. Now, to my “beloved” USN. While waiting for deployment to Vietnam, I shared a temporary posting in Monterey, California with a troubled man named Bob. We were both beset by unhappiness. Mine was from a temporary habit but his was deeply rooted. He owned a car and we would go for long rides along the coastal highway and bemoan our fates. We once drove to the gates of a compound owned by Joan Baez where, it was rumored, one could gain passage to Canada. I don’t know. We “chickened out” at the last moment. It was not the most positive personal philosophy I have ever heard, but it was entertaining, the way he would rant on about it. I don’t know what happened to him eventually. He disappeared one day and I didn’t hear from him until just before I shipped out. I was called to “The Deck” and told, by a frowning Officer-in-Charge, that I had a call and to make it quick. So I will. It was Bob calling from the “nut-ward” at the Treasure Island Naval Base in San Francisco Bay. “What are you doing there?” I said. “I just gave my bucket of s**t away,” he yelled. Then they took the phone from him and, I suppose, led him away. Now the football player: I read this week where a former pro football player, now an exec with the NFL, said he didn’t believe in social “safety nets,” which was why he voted conservative. I just couldn’t help thinking about a young child standing to be identified forever as a burden to society and what it must mean to carry that through life. And then, I thought of buckets of s**t. Well, I also thought about pieces of s**t.
See his latest book at Wattensaw Press.